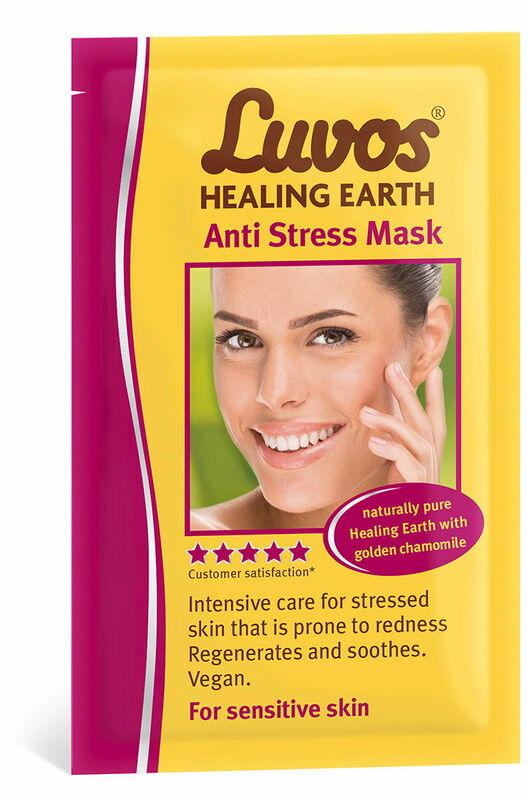 Naturally pure Healing Earth revitalises dull and stressed skin with valuable minerals and trace elements. Together with golden camomile, special botanical essences and soothing calendula oil, this high-quality active ingredient complex neutralises stress factors and noticeably* restores the balance of the skin barrier. Intensely regenerates and nourishes skin that is prone to redness. For a beautifully radiant complexion. Confirmed effectiveness* and tolerability, with naturally pure Healing Earth, from the market leader in Healing Earth, since 1918. * User study, under dermatological management, by the independent Dermatest Institute, commissioned by Luvos. Application: Apply the mask evenly to the face, neck (and décolleté), avoiding the skin around the eyes and mouth. After around 10 to 15 minutes, remove the mask using gentle massaging movements with lukewarm water and a cotton-wool pad. For perfectly cared-for skin, follow up with Luvos® Face Fluid. Ingredients: Aqua, Sorbitol, Alcohol, Caprylic/Capric Triglyceride, Glycerin, Loess, Cetearyl Alcohol, Glyceryl Stearate Citrate, Zea Mays Oil, Simmondsia Chinensis (Jojoba) Seed Oil, Glyceryl Stearate, Glycine Soja (Soybean) Oil1, Macadamia Integrifolia Seed Oil, Bellis Perennis (Daisy) Flower Extract1, Sesamum Indicum Seed Oil1, Aloe Barbadensis Leaf Juice Powder, Chrysanthellum Indicum Extract, Camellia Sinensis Leaf Extract1, Nigella Sativa Seed Oil, Tocopherol, Calendula Officinalis Flower Extract1, Helianthus Annuus (Sunflower) Seed Oil1, Cetearyl Glucoside, Magnesium Aluminum Silicate, Xanthan Gum, Maltodextrin, Phenethyl Alcohol, Sodium Hydroxide, Parfum (Natural Essential Oils), Linalool2, Citronellol2, CI 77891 (Titanium Dioxide), CI 77492 (Iron Hydroxides). 1 Ingredients from certified organic agriculture. 2 From natural essential oils. Dermatologically confirmed skin compatibility. Vegan.